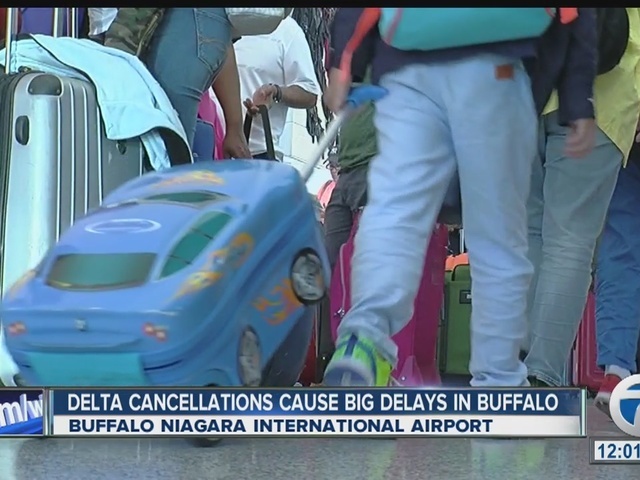 A Delta computer issue grounded hundreds of flights across the country, including several flights in Buffalo. LONDON (AP) — Delta Air Lines canceled around 365 flights Monday after its computer systems crashed worldwide, stranding thousands of passengers on a busy travel day. That number is likely to grow. 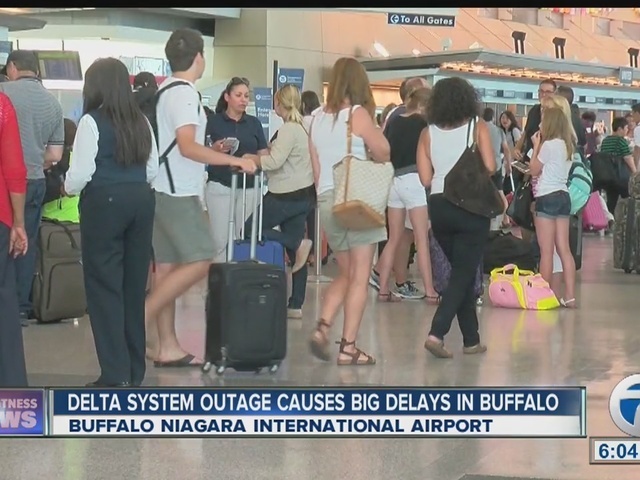 More than 1,000 flights were delayed, according to flight tracking site FlightStats Inc.
Delta has issued this waiver for travel between August 8 through August 12. About six hours into the outage, limited flights had resumed but widespread delays and cancelations were ongoing. A spokesman for Georgia Power told The Associated Press that the company believes a failure of Delta equipment caused the airline's power outage. He said no other customers lost power. Many passengers were frustrated that they received no notice of a global disruption, discovering that they were stranded only after making it through security and seeing other passengers sleeping on the floor. Last month, Southwest Airlines canceled more than 2,000 flights over several days after an outage that it blamed on a faulty network router. United has suffered a series of notorious delays since it merged with Continental as the technological systems of the two airlines clashed. Technology that appeared to be working sometimes issued bad information. Flight-status systems, including airport screens, incorrectly showed flights on time. Word of the extensive breakdown began to spread after the airline used a Twitter account to notify customers that its IT systems were down "everywhere." Technological issues extended even to the company's website. Tanzie Bodeen, 22, a software company intern from Beaverton, Oregon, left home at 4 a.m. to catch a flight from Minneapolis and learned about the delays only when she reached the airport and saw media trucks. Yet many passengers still did not know where the rest of their day would be spent, and decisions on refunds would have to be made later. At noon inside New York's LaGuardia Airport, Francesca Villardi still had no idea when her 11:50 a.m. flight to Fort Lauderdale, Florida, would depart. The departure boards said her plane was leaving on time. She received different answers from three Delta employees, one of whom said she would be traveling to Cincinnati first. "This is not organized at all," said the 51-year-old professional organizer from Pembroke Pines, Florida.